Due to the poor quality of the contact surface, I first lapped the heatsink with fine sandpaper to a wonderful flat shine. Then for that added bit of perfection I finished it off with some steel wool. I then applied a paper-thin layer of Arctic Silver 3 on the core of the CPU. Both clips went on easily and I was ready to go. A warning for those who like to install the heatsink with the motherboard in the case. The power supply in most cases will make it difficult to reach the second clip. The clip will be buried underneath the angled side of the heatsink. I installed the cooler both ways but recommend, for your peace of mind, to install externally from the case. I found from the second that I turned the Golden Crown on, it lost the elegance that had appealed to me. The quad-led fan may be nice and all but it really does not match the gold styling of the metal itself. It's not unlike having solid, beautiful hardwood floors and then painting the walls a neon green. Consistency is the key to beauty and this is simply a terrible design choice. Todays craze of flashy colours must have clouded somebodies judgement. 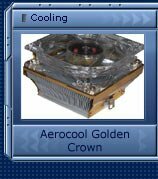 The Aerocool Golden Crown was tested against my trusty stand-bys: a copper core generic cooler (36cfm) and a Globalwin FOP32 aluminum cooler. A clock speed of 1.75ghz was reached by all three coolers for overclocked temperature tests. Due to the processor being the older .18 Palomino core and the motherboard being an Abit KX7-333 the recorded temperatures may seem higher than normal. The Ambient temperature was 25 C throughout the entire testing period. At stock speeds the Golden Crown is a good match for the much louder Generic. The Generic also features a copper insert which attests to the superior design of the Aerocool. As expected the older FOP32 stays well behind. It seems that under a much greater temperature load the copper base of the Generic gives it the edge. The FOP32 is starting to make me very nervous. Even though the Golden Crown produces higher temperatures than the Generic, you would have to have a tendency towards self-abuse to choose the Generic first. The high-pitched whine is enough to drive someone crazy. I'd take the gentle whir of the Golden Crown anyday. Website is designed by Mohsin Ali. 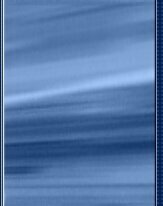 All graphics is (C) Shapps Technologies 2001-2002.